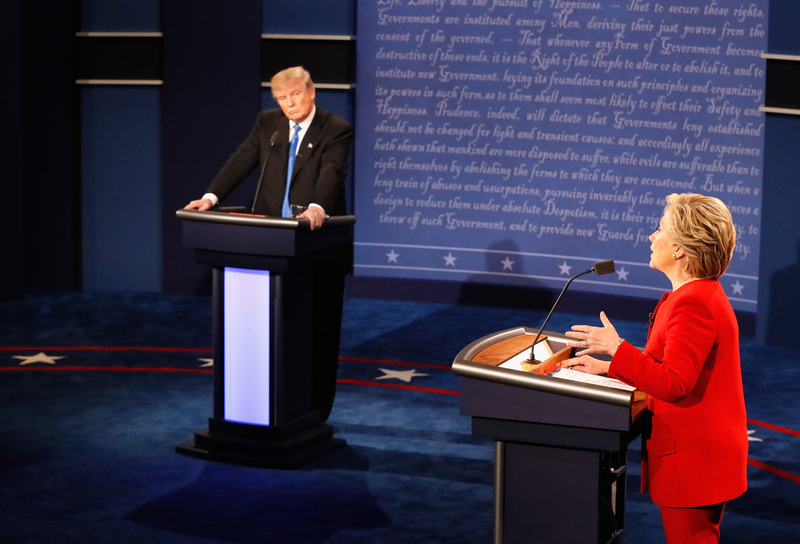 Plenty of media outlets fact-checked the first presidential debate between Hillary Clinton and Donald Trump on Monday night, but Merriam-Webster did things a little differently by tweeting out which words people looked up during the debate, after hearing the candidates use them. Speech has been a huge — I'm sorry, yuuuge — topic of conversation in this election cycle. Linguists and rhetoricians have analyzed the Republican nominee's speech patterns, even to the point of determining that he speaks at a 4th grade reading level. His unique way of addressing any given issue has made for great pundit fodder. Criticism of Clinton's speech has had very little to do with what she says. Instead, detractors focus on her supposedly loud and shrill tone, and Stockton University professor Amee Shah notes that the cleanness of the Democratic candidate's accent could be to blame for some of the gendered flack she takes. So it may surprise you to learn that Trump was responsible for many of the words debate watchers looked up on Monday evening. Words like "braggadocio" and "bigly" prompted viewers to ask Merriam-Webster for advice. Incidentally, "bigly" has spawned a debate of its own, over whether Trump actually said "big league" instead. Both are real dictionary entries, however. Here are the words everyone was searching for during the debate, according to Merriam-Webster.